**Free book offer: You can get free a copy of this, the first published book of C. Steven Blue's work. Just order any other book on this website authored by C. Steven Blue, then, in check out, mention this book offer and this book will be included in your order for free. 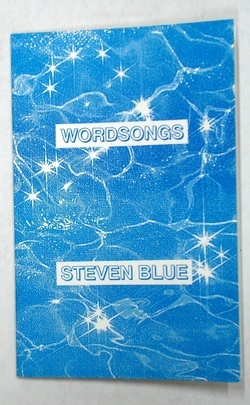 WORDSONGS: Steven's very first published book, self-published over twenty-five years ago, when modern self-publishing was still in its infancy and before desktop publishing made it easy for almost anyone to self-publish a book. Back then you had to do actual physical layouts of both the cover and manuscript, then submit them to a bookmaker in mid-west America, wait for the proofs, then pay them to print your book, at a minimum of 1,000 copies. This is the first book in the Wordsongs Series. Each book in this series is interwoven into a theme and contains twenty pieces (with side 1 and side 2) in a concept similar to a vinyl record album. 1. a poem that is like a song or could be a song. 2. verses that tell a story in rhythm, sometimes with a refrain (or chorus). 3. a song that you read. 4. a poem that sings to your imagination.